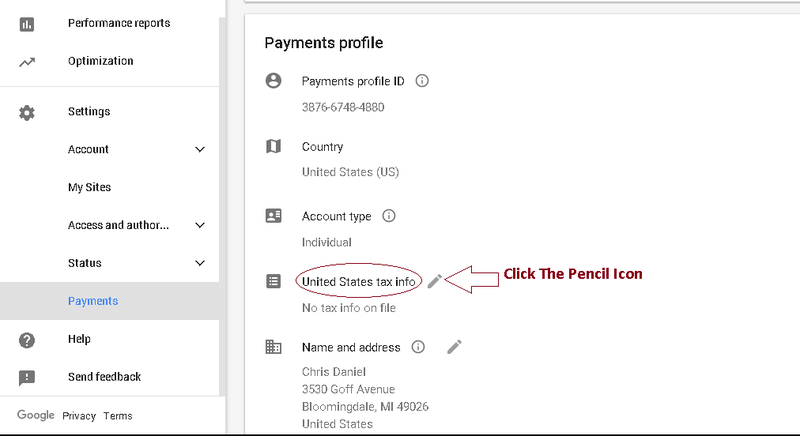 If you are a USA publisher, a question of how to fill your tax information in your Adsense account must arise.This is as a result of the fact that every USA Adsense publisher must undergo a mandatory Tax verification in order to determine how much the individual will be charged as tax.This tax verification must be complete before Google Adsense can release payment to the individual.But of course, I will show you how to fill your tax information if you are a non-USA citizen so you can receive your payment. But first thing first. You need to first obtain your Tax Identification Number(TIN) Tax Identification Numbers are issued by the Internal Revenue Service (IRS); the U.S. government agency responsible for tax collection and tax law enforcement. The TIN is a 9-digit number which is used to determine individual tax returns. Do not Panic If you do not Have a TIN (EIN,SSN,ITIN). 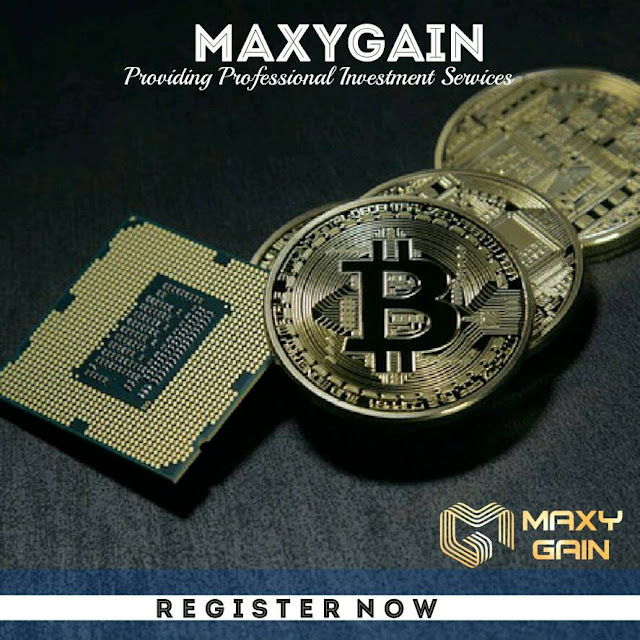 I have already prepared a post to show you How to obtain your TIN or EIN for your Businesses and Adsense Tax Verification .If you are yet to get your TIN, avail yourself this opportunity and read this post. Click Here to read before continuing with this post. 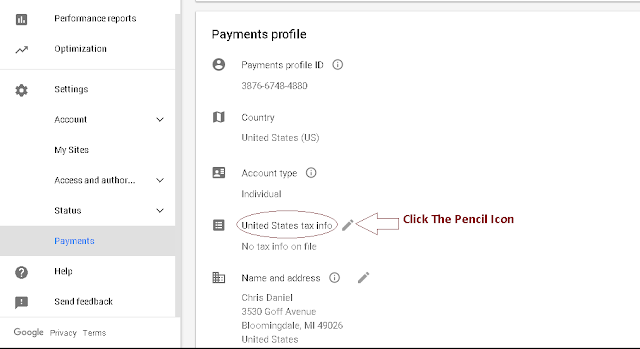 If you have got your TIN, let me proceed to show you how to fill in your Tax information to your Adsense account. Login to your Adsense account. Click on Settings and then on Payment. 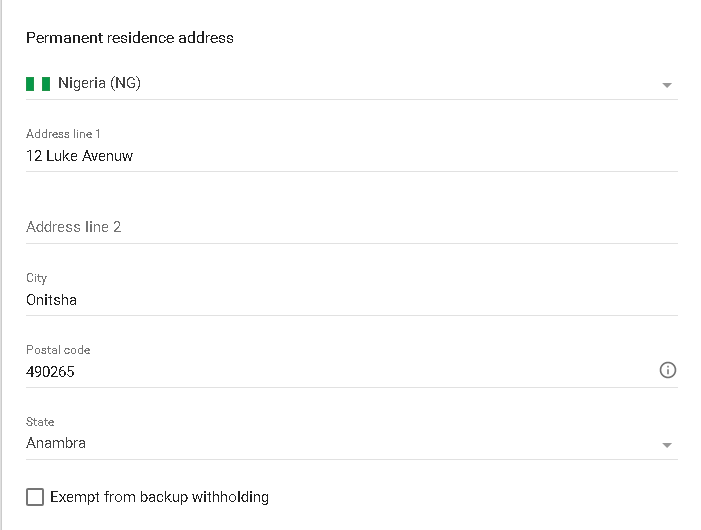 Next click on Manage Settings. Refer to the image below. On the next page, you will be asked whether you are a USA citizen or non-USA citizen. Please, choose Yes and click on continue. Check the image below. After clicking on continue, you will be presented with the tax for (labelled Form W-9 Tax info) . This is the sensitive part. Remember that among the information you submitted to IRS on the process of obtaining your TIN are your First Name, Last Name, Street Address, City, State, ZIP, Country, Business Name and Entity Type.. You are mandated to fill in same to your W-9 Tax info. (Refer to below picture) . It doesn't matter if these information is different from the one in your Payee Profile. 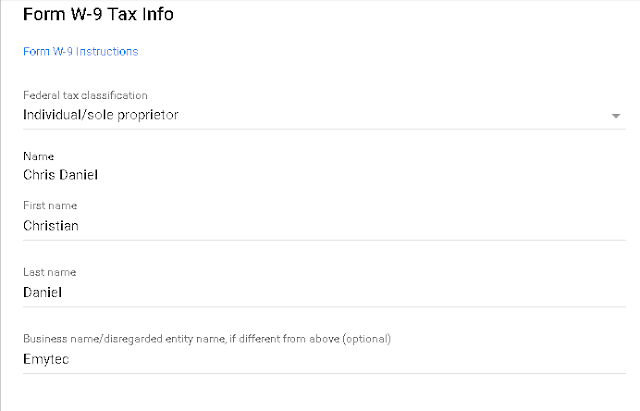 Just fill the information and move on.If you are on the right track, the image below should be same as yours..
On the next line which is business name , enter your business name as submitted to IRS. On the part I of the form, you will be required to enter your Tax Identification Number. On the Tax ID Type, Choose EIN and enter your 9-digit EIN as obtained from IRS. This is illustrated in the picture below. On the Part II, do not tick the checkbox. Then enter your name as Signature of U.S Person and click on submit. Check below image. Is that EIN shown above is real? Hello chris thanks for the awesome post. I sent you a mail but you didn't reply. Please I will like to know if you can graciously post or send me your number so we can talk. thanks. Hello Oganaij..... Resend the mail. Thanks! Thanks for reading my blog, Dayo! Hello Chris, I need your assistance with my USA tax information fill out. What you want is people who have a specialization and a general understanding of the whole situation. Hallo I am non us residense does required to fill tax information?